Check out the serious look as I sit in front of my beloved Mac. That’s because I’ve got my game, or publishing, face on! Everyone’s got a passion for something – that internal fascination that pulls at them, pumps them up, and provides positive energy to fuel their individual identity and existence. One of my passions is publishing, and I’ve enjoyed a lifelong love affair with this brightly golden gem. A quick recap of Dictionary.com’s definition. A Publisher is one who proclaims publicly; announces formally; promulgates for distribution and declares in an official or formal manner. The description pretty much sums me up and provides cool evidence of my lifelong passion for publishing. Here’s a quick review of how, over the past 50 years, my passion for publishing has grown from tiny little candle to its current, megawatt status. As a preschooler, I sat daily beside my grandfather’s legal secretary, watching intently and probing politely as she tapped rapid-fire upon the green-capped keys of her Royal manual typewriter. 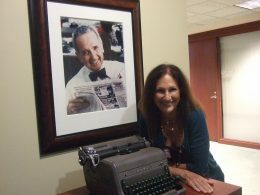 Posing with the iconic Royal Typewriter used by legendary Publisher Nelson Poynter at the Poynter Institute in St. Pete, FL. As a preteen, I purchased a How To Type book and taught myself to peck away over the summer. Applying myself to constant, repetitive drills (at that very same Royal typewriter, I might add), I developed finger strength and dexterity and used this exciting new skill earning temporary income as a clerk/typist. As a student, I gained limited celebrity manually scribing copious class notes on unlined paper with near-precision leveling, the contents of which faithfully reconstructed the information and spirit of my instructors in near verbatim style. The note-taking ability was appreciated by fellow classmates who, either unable to read the pages of their own notes or not having taken any notes at all, were quickly illuminated into borrowing mine. As a high school teen, I stoked my passion for publishing by conducting interviews and writing articles for our high school newspaper. By senior year, I added editorial writing to the mix, having been appointed editor of the periodical aptly named The Lighthouse. As a college student, my embers of interest met both opportunity and financial rewards. During mid-terms and finals, I charged $1 per page to convert sketchy ink handwriting from fellow undergrads into officially acceptable typewritten text. Editing became an unintended part of my services, as I couldn’t resist improving upon spelling, grammar and punctuation. As a graduate student, I moonlit as editor of a national executive search newsletter. Living in the NY Metro area and surrounded by some of the world’s biggest headquarters, I conducted C-level interviews at top Fortune companies with some of the brightest executives, then conveyed their philosphies to a coast-to-coast readership. I won’t bore you with the my next 30 years of publishing particulars. What’s important to note is that regardless of time, circumstance or locale, I’ve remained connected and faithful to this beloved art of communication. As Publisher at New Vision Entertainment, LLC, I publish the MIKE Sports Comic Book series. In addition to doing all the editing, proofing, streamlining of the stories in the book, I exercise my creative bent in helping design the comics that appear with the books. Also, published a perfectly rhyming preschool series found under the name Inky Winky Spider. Inky can be found in written, audio, DVD and mp3 formats with Inky’s ebooks looming on the horizon. Celebrating our best-selling Inky Winky Spider series of rhyming books on Tampa Bay’s Studio 10 morning TV. Left to right: host Michelle Phillips, Author Cyndi Sue, Publisher Maura Sweeney and co-host/comedian Tim Wilkins. A very fun – and funny – morning. I write my own blog under Maura4u and a second one at Salon.com. Increasingly incandescent in my interests, I can even be found publishing orally and visually, both in English and Spanish (es posible que esta mujer no se pueda callar:) , via a series of YouTube videos and through a national audio platform. The beauty of publishing my blogs is that you can post wirelessly from anywhere – like on this bus in the middle of Bulgaria. If I were around at the dawn of the written word, chances are likely I would have been found chiseling letters into rock or affixing parchment paper announcements to trees. What good fortune for me that I find myself, instead, poised right here in the New Millennium, publishing thoughts in today’s easy, economical and ubiquitous forms. This passion for publishing has brought me plenty of personal satisfaction over the years. I’m basking in the light of it even today. I now publish my own book series on Amazon entitledThe Art of Happiness.